I have been counting down the days until this kit was available and now its here! While Supplies Last: Sephora's Sun Safety Kit. 19 Bestselling Pieces for $30 - a $210 Value! Packaged in a reusable cosmetic bag. What you get: $210 of sun care products! A set of 14 deluxe samples of sun-protection products, two self-tanners, a primer, and bronzing powder, all in a reusable cosmetic bag. 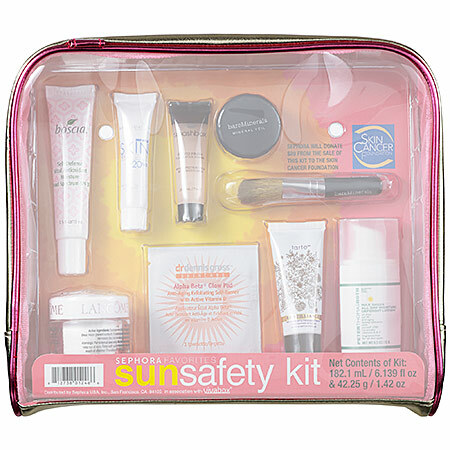 Sephora and The Skin Cancer Foundation are proud to unveil the seventh edition of the Sun Safety Kit. 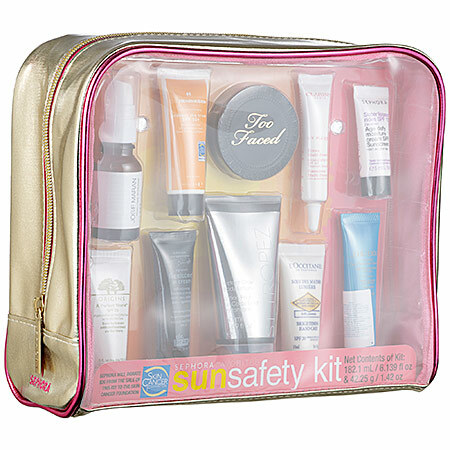 This annual partnership in sun protection is one of Sephora’s most popular kits. The collection features past SPF formulas and safe self-tanning favorites, plus new sizable additions for your sun protection arsenal. A $20 donation from each kit will benefit The Skin Cancer Foundation. Skin cancer is the most common type of cancer found in the United States and is also one of the most preventable. Help others become aware of this growing problem while defending yourself against the sun’s harmful rays with this comprehensive kit. There are sooooo many samples to choose from in this bag. I bought 2 and am giving one as a gift. ***Please comment below and let me know which sample you are the most excited about.